A leading luminary of the architectural profession once told me that what most turned him on were not glorious drawings of beautiful structures but a simple catalogue of building components. This revelation came back to me while watching Noé Soulier’s clever double-header in a disappointingly, far-from-full Lilian Baylis Studio. 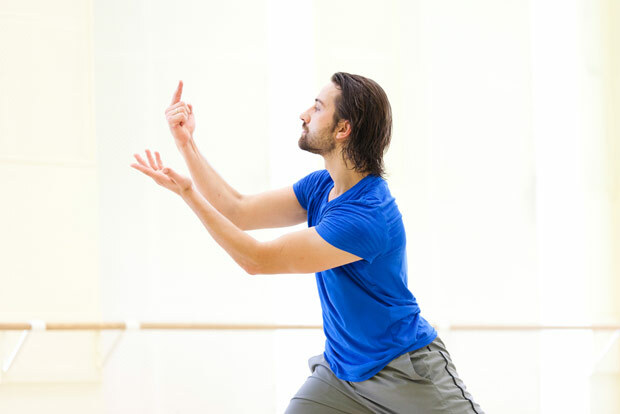 Soulier has created two thoughtful and captivating dance works from the ingenious simplicity of systematically cataloguing the building blocks of ballet and then having some deconstructive fun by shifting these basic elements around. In the opening Le Royaume des Ombres (The Kingdom of The Shades) the choreographer begins by explaining (with admirable brief efficiency) the separate sequences that comprise the work. The first of these is a balletic equivalent of that catalogue of building components: a glossary that threads together an A-Z of ballet technique into a clever little party piece, where the reverence precedes the tours en l’air! It is followed by two more solos which include only the “preparation” steps (ie all of the steps that precede and link together the main turns and jumps in a classical variation); the first based on centre work in a typical class and the other showing Solor’s 3rd Act variation from La Bayadère; but extracting all of what Soulier describes as the “audience” steps (meaning the jumps and pirouettes). He then dances these classical sequences but stops at the point of each jump like a man teetering on the precipice, or someone continually starting sentences that never reach their conclusion. There is no set or music apart from the sound of the performer’s breathing and we get a little extra, since to compose himself and get his breath back, Soulier marks his way through routines before dancing them. The final tour de force is a chronology of nineteenth century ballet, demonstrated in a patchwork thread of bite-sized chunks from each work (for example, the opening bars of the Bronze Idol’s solo from La Bayadère). Many of these excerpts (La Sylphide, Giselle, Paquita, Swan Lake) are immediately recognisable; others could have been from any classical ballet of the later nineteenth century. Somewhere in the early catalogue there was a reference from Natalie, the Swiss Milkmaid, danced in Paris by Taglioni in 1832. In these morphed highlights of the greatest hits of nineteenth century ballet, Soulier danced roles for men, women and various magical creatures. It was hard work for such a small audience but exceptionally well done. In D’un Pays Lointain (In a Country Far Away), Soulier opens another catalogue, the one that codifies the language of ballet mime from the nineteenth century. He has identified over 80 different movements with a specific meaning and the piece begins with one female performer simply running through this compendium alphabetically before graduating to all four dancers from the Ballet de l’Opera du Rhin (on whom Soulier made this work) performing a kind of round, separately picking up and performing the spoken meaning of each mimed activity from a sequence of different voices. The juxtaposition of spoken and mimed language showed how some movements looked similar but held very different meanings. It also enabled a passage of sequenced movement, with the actions spoken simultaneously, to be read in different ways: by hearing chronological instructions; or visualising a line of mimed actions, either from left to right or vice versa; or in a mix of both these aural and visual texts. The last phase is performed in silence with a lone dancer amalgamating mimed phrases in a way that creates a disorder out of this ultra-disciplined code. It came to be a fascinating puzzle of trying to quickly decipher familiar movement in unfamiliar patterns, and mostly failing. Apart, from the dancers’ remarkable speed and dexterity, the most incredible thing about these works is that Soulier provides an intense examination of ballet’s vocabulary, never once deviating away from this classical base, but in doing so he creates something exceptionally modern and surprisingly non-balletic. As with many of the best innovations, his ideas are infuriatingly simple but they run very deep. He is certainly a dance maker to keep an eye on and I’m pleased to say that he will soon be back presenting another of his works, Idéographie, at Dance Umbrella in the autumn. The Fidelity Project had a strong run to the Final of The Place Prize in 2010. Co-created by Frauke Requardt and Freddie Opoku-Addaie, and jointly performed by this duo, it is a work that I have seen several times before but one which remains distinctly fresh. This is partly because the choreography is so tightly conceived that it often appears to be improvised and partly because any work that smells of newly cooked popcorn has an immediate antidote to staleness! It succeeds largely because Freddie and Frauke are strong and charismatic performers, creating an immediate bond even while they are dodging each other’s slaps and kung-fu kicks. As well as appealing to our olfactory senses, the vintage popcorn machine provides an in-built timer through its two rounds of cooking, a sizzling addition to the dizzy 60s electronic soundtrack and a momentary respite for the performers when the cooker needs to be refilled. It was good to see it – and The Fidelity Project – one more time.